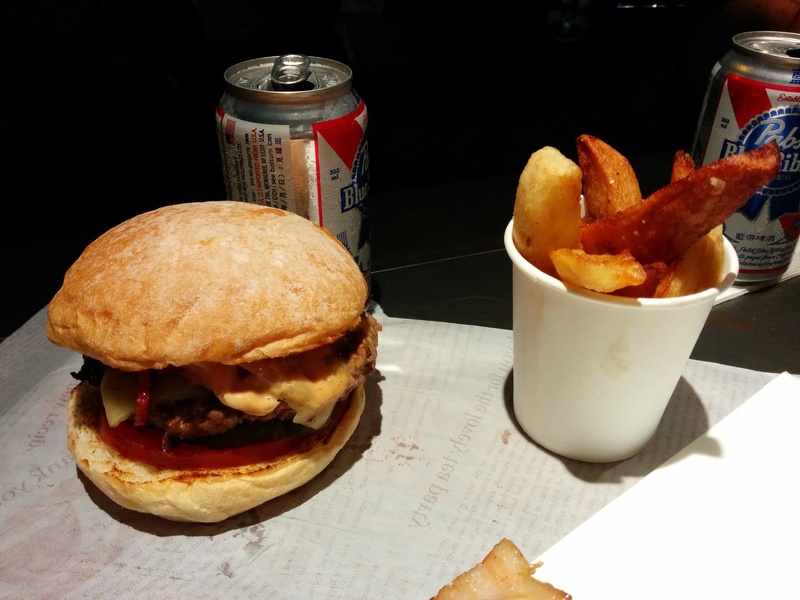 The Butchers Club burger is an exquisitely good hamburger. It is a hamburger that has received proper burger care and tenderness, that brings forth a wondrous experience that begins with the creation of a burger that manages to stand its ground. Surrounded by meat filled cabinets and formed from within mountains of minced beef, the patty is forbearignly massaged and fashioned within the humble hands of a ruggedly bearded man. The men in the kitchen, who seem like burger spartans in their element, lay out their ingredients ready to defend their great burger entry into Hong Kong’s hamburger repertoire. 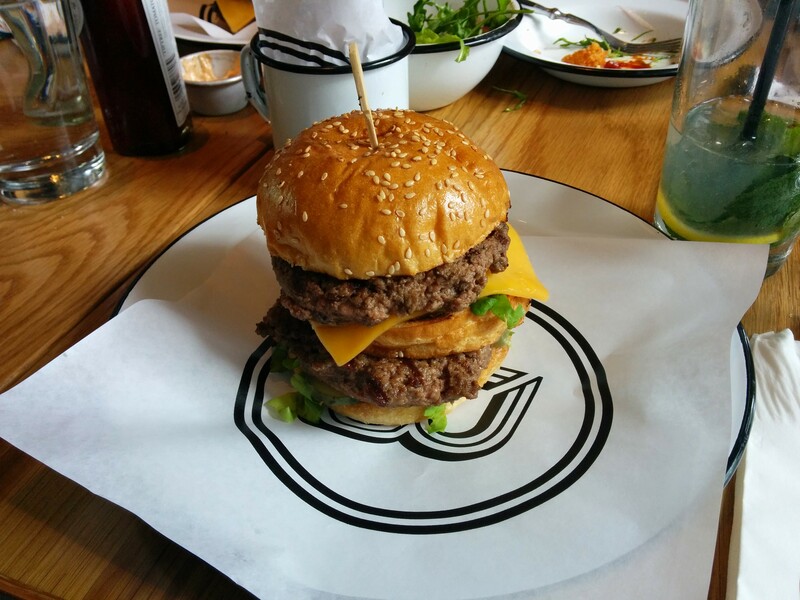 The burger construction seems precise and the measurements well crafted – structurally, the burger stacks up with a tight bespoke hamburger feel, with the right burger length ratios. Yet, it’s a shame that the hamburger isn’t slightly more beefed up; moments before the end, one wonders whether or not to get a second – a decision that is, unfortunately, not solely weighed on a great burger taste balance. Still, made apparent as one smudges the burger’s face against the board to soak up all the juices from the marvelous swirl of rich tangy secret sauce that mixes so well with the meat drippage, the burger holds steady throughout. 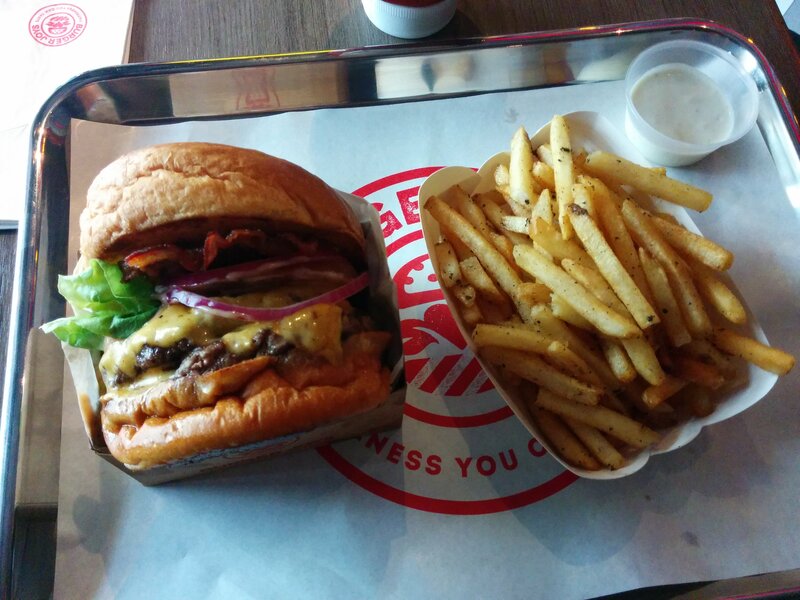 The ingredients, victoriously achieving a great burger taste balance that keeps charging until the end, are good. The beef patty is soft and tender, cooked to a proper temperature with a whimsical taste, it rips ever so softly pillowing onto one’s taste buds with a true juicy beef flavor and pleasant grilled singe on the outside. The cheese that lies on top, adds a real layer of lazy gooeyness – not so strong to overpower and not too weak to pass by unnoticed, it swings just right. The bacon, a small treasure hidden inside the burger, is just that – a single lonely sliver of bacon that impulses the burger taste balance upwards, that lusters through the burger, but that will leave a yearning for one more piece. While the burger, for the most, feels great and enjoyable, the vegetables – the single slice of tomato and cooked onions fall somewhat short – doing little to satisfy one’s primal urge to connect with nature. The sweet bosom of a bun, soft and tender with a brawny grilled springiness, with a sprinkle of flour that kisses one’s lip leaving a speck of a white mustache, is a respectable addition. The duck fat fries are alright. For 100.00 HKD you can get the stand alone burger, for an extra 20.00 HKD you can get the fries; though not a high price compared to other Hong Kong burgers, when you consider the size that feeling might adjust, and soon be forgotten as one savors this burger; a formidable burger, one that even a couple of guys on an icy wall can look forward to after a hard night’s work. 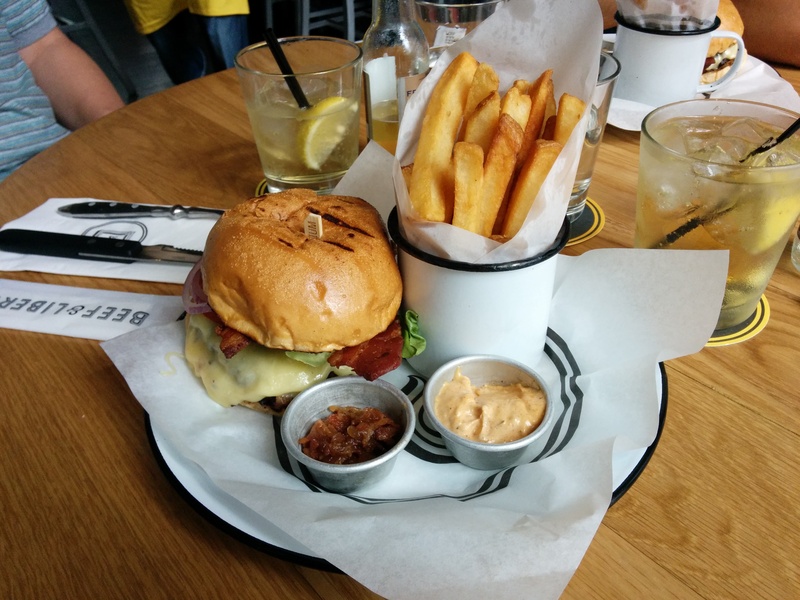 Wooloomooloo’s beef burger is a good decent hamburger. More likely than not, one is sure to have a great burger experience; soaring high above Hong Kong’s rooftops, accompanied by magnificent views of Kowloon and the Island, as you scan the horizon at the verticality that is this city – it’s easy to get sidetracked on what’s important here: the actuality of the burger. 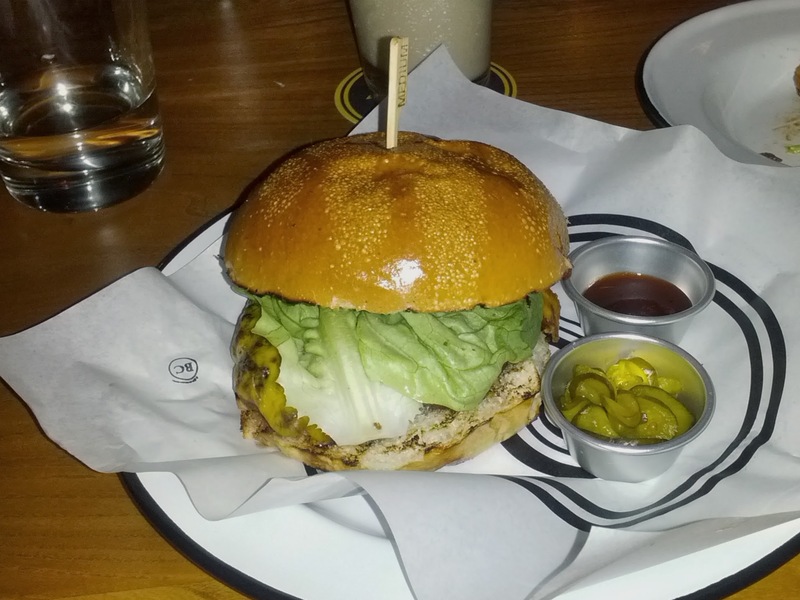 Like I said, this is a burger experience that is worthwhile; but, does this hamburger inspire as much as its setting? The burger’s introduction is immediately received with a pair of mixed feelings, while the overpowering whiteness of the plate might induce a notion of bleakness, as if something is missing, the attractive and sizable burger brings forth enthusiasm. As one becomes a witness to these emotions, and one begins to devour this hamburger, there is a realization that there is a pattern of ups and downs to this burger; in the end, the result is a burger, that unlike it’s view, is uninspiring. The ingredient seem to be of a good quality, and as one, they do manage to pull of an decent burger taste balance; still, they do boast a certain burger carelessness, eventually becoming apparent that with a little more attention these ingredient can live to deliver a burger taste balance of a much higher degree. The juicy sirloin beef patty manages to radiate a wonderful beef taste, a flavor that rises above all other ingredients; regrettably, the taste is not enough to make up for its insufficiently thin proportions. The bacon, rich in that awe inspiring bacon taste, is sadly noticeably flabby in feel; the cheese, soft and gooey in texture, is a tad too sharp in flavor; and the vegetables, while crisp and balanced, stem blandness. You see, with this hamburger everything is good, but there’s always a ‘but’. Only the egg, with a firm white, and runny tasty yolk, manages to pull through unscathed. Then there’s the bun; inappropriate for this kind of restaurant, has no salvation… overbearing in size, dry and rough in texture, feels like the most generic burger bun one could find; the ease in which the bun tears away, concludes in a conscious awareness that this burger is poorly constructed. The fries, crisp with a soft center, are alright. 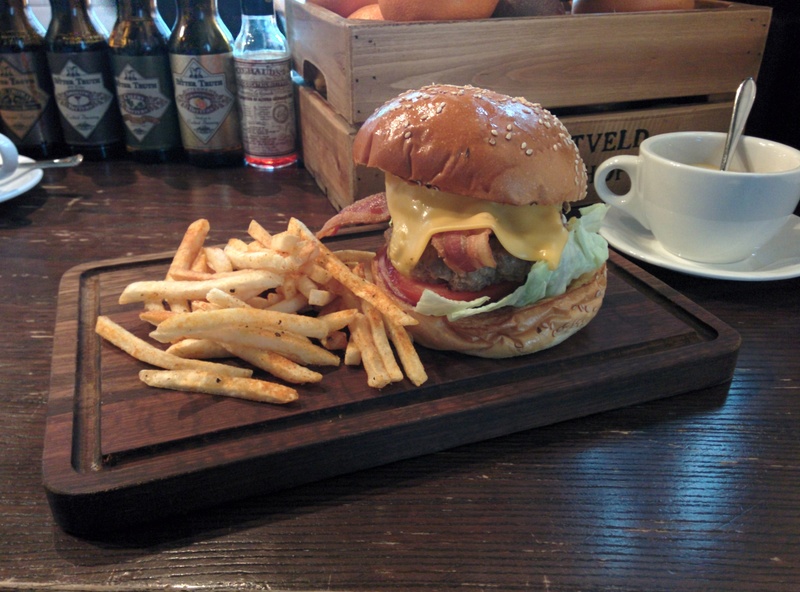 For 155.00 HKD, this is a good burger experience. Unfortunately, not so much because of the burger, but because of the setting. This is a hamburger with a view, an inspiring view that makes the burger experience so much greater than it actually is, but if found on the ground floor, this burger experience might become somewhat more real. Ted’s cheeseburger is a decent hamburger. The burger actually shoulders a superb burger taste balance; sadly, this great hamburger performance is belittled by a patty that feels embarrassingly inappropriate – a patty that because of its dwarfed size struggles to glisten as it hides in-between the other ingredients. As you await for the arrival of your burger, as you peer at others’ burgers, as your head frantically twists and turns looking for a sign of proper burger proportions, and as you begin to realize that size does matter – prepare to have a moment of disappointment sink in. As I said, the burger taste balance of this burger is exquisitely good; the bacon shines through with a chewy firmness that brittles as it enters your mouth, the vegetables feel fresh and alive with color and taste; the cheddar cheese adds the right amount of gooeyness without being too vague; and, if you throw in some truffle aioli, be sure to expect a flavorful buttery touch. The bread is savory, it has a soft chewy sponginess to it, it is a good bun; and when you do manage to meet the meat, the meat has a great juicy beef taste, a beef flavor that is strong and untouched. The problem… the misfortunate size of the patty that throws the whole burger ecosystem out of balance; suddenly, the bread seems too big and airy, the onion too powerful, it feels like there is too much empty space in this burger. The moment you pick it up there’s a sensation of wobbliness, a construct about to topple out – you’ll notice amateur burger eaters struggling to hold it together, and the more adept eaters keeping a lookout for falling ingredients to not leave behind. But persist, after a few bites of too much bread and too little meat, once you’ve bitten through the outermost regions and begin to reign on the patty you will be rewarded with a great burger taste balance and that burger satisfaction – if only for a number of bites. The fries are great. 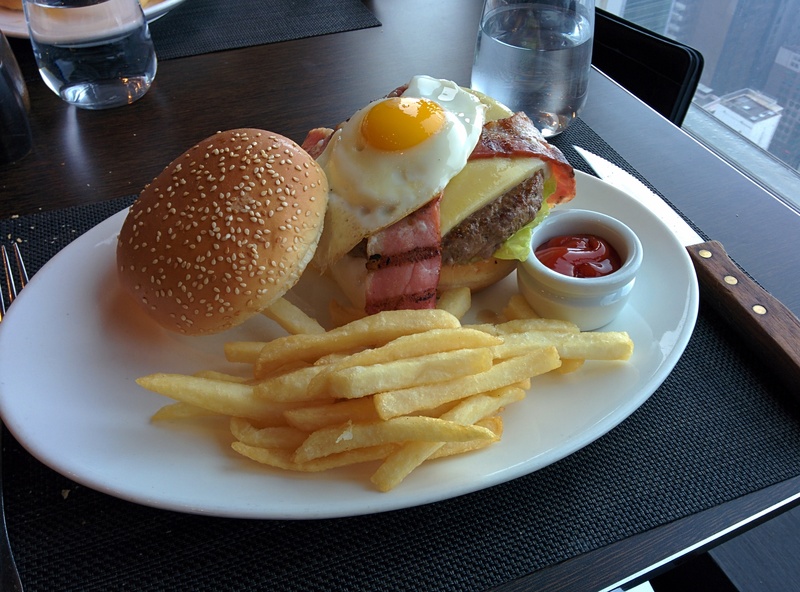 For 128.00 HKD and 15.00 HKD for additional toppings, such as bacon, based on the burger taste balance, this is a good burger to try. However, one would wish to not be disappointed by an ill-suited beef patty, and resulting poor stability. Hopefully Ted will one day look out from his lookout into the horizon and realize the potential in his burger. I don’t know if this is a case of restaurant frugality, or a consideration to serve a ‘light-er’ lunch burger (burgers are only served for lunch); but I do know that proper burger proportions are essential for a decorated burger. The hamburger makes an entry in a promising light, a light that dwindles down upon the first few bites; as you begin to traverse this burger, you are soon to realize that it lacks a certain hamburger excitement. The well circumferenced patty, properly matching up to the edges of the bun and with the right temperature, has a notable beef taste. In itself, the patty makes a strong stance, a stance that is unfortunately brought down by its fellow compatriots. The dull egg, with a mild baby chicken flavor; the tedious vegetables, thick and at times, in particular the onion, overbearing; and the flat bacon, cooked to a softness that shouldn’t be allowed for bacon – all three contribute to create a feeble burger taste balance. The bun brings forward and insipid usefulness – while it can hold the burger as one, it’s dry and at times provides an excessive bread feeling, one that could probably be countered with a slightly thicker patty. Given that the beef patty is at a whole other level of richness, you’ll wish that the other ingredients had the same level of commitment – there is certainly no ‘I’ in ‘team’, but ‘team’ spelled backwards reads ‘meat’, and this burger has that going for it. The ginormous wedges are good. 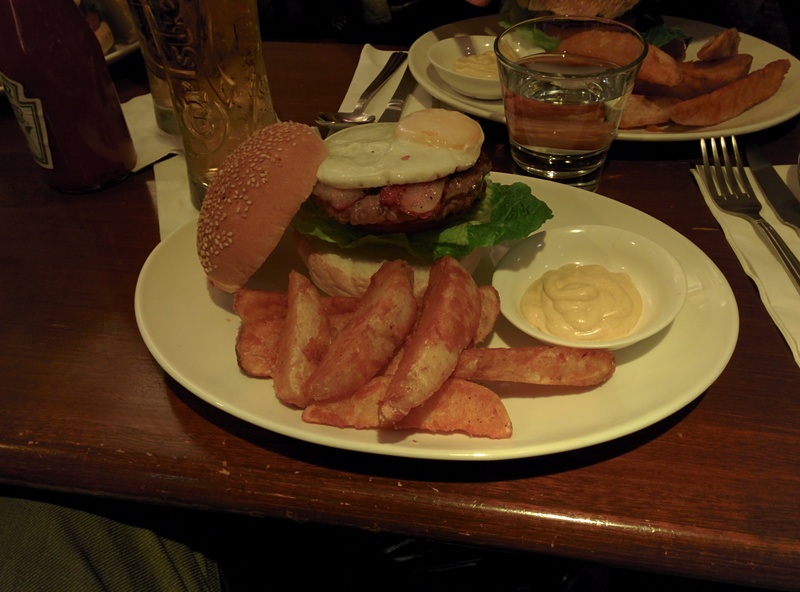 On any other day than a Monday i’m not sure i’d go too much out of the way for this 112.00 HKD burger; but come Monday, I know I wouldn’t say no to this decent burger with a pint of beer for 98.00 HKD! Like I said before, it’s already a decent way to start the week! The Bacon Cheese burger is a superbly decent hamburger; Beef & Liberty has certainly done a great job in delivering a rich beef patty, while taking the liberty of disregarding everything else that makes a burger feel and taste so good. The burger isn’t bad, its just that throughout the hamburger experience there’s an impression that something burger is just not quite there. 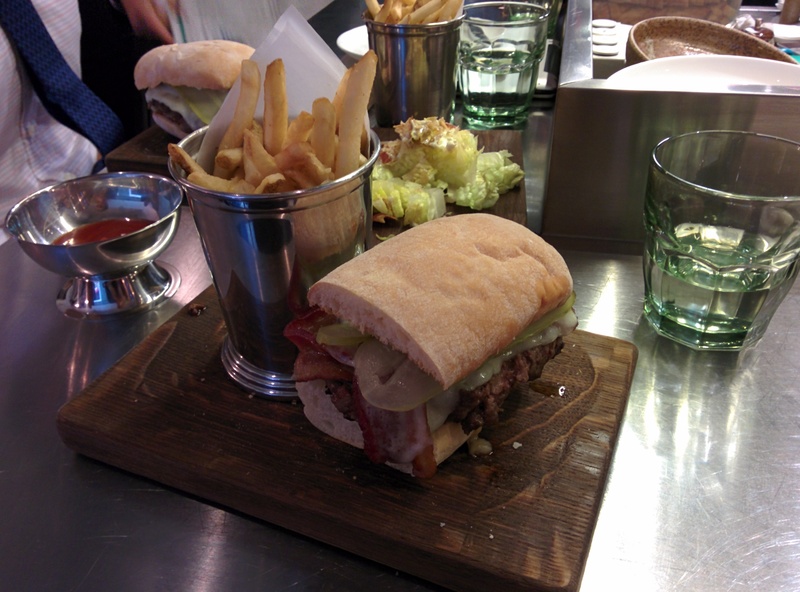 It all starts with an awkward introduction; the burger, placed on a ‘bedpan like’ metal plate, is seemingly simpler than what is described and expected from the cumbersome menu. As the hamburger arrives a single leaf of lettuce, cut and draped over the inner workings, will have you asking yourself ‘where’s the meat?’; and the few condiments on the side, in an uninspiring presentation, might give you an irked feeling as you think to yourself ‘why doesn’t it all just come as one?’. Opening the hood to check out the insides will not improve things, and the subsequent consumption makes things only slightly better. If you’re looking to enjoy some greens in your burger, look no further than the desolate leaf of ‘butter’ lettuce, cause there isn’t anything else. The sole piece of fair tasting brittle bordering on dry bacon has been miserably shattered and thinly spread inside; and a fine coating of bland cheese appears to have been almost melted away, a likely sign of an eager entrance during the preparation. The bacon jelly does manage to add a nice sweet zesty flavor, but only as a glimpse. The amount of love for these ingredients is too damn low! As I mentioned, they certainly did get the beef part right; the patty, a strong companionator for a great burger taste balance, is utterly exquisite. The beef flavor is strong with this one, it feels lean, juicy, and rips easily. The grass fed cattle was sacrificed with all the right intentions, but the results as a burger are plain decent. The bun which is actually itself not bad, with a soft core and crisp exterior, does a good job at holding, and hiding, the scarce amount of fixings; still, as you gaze and demolish, the sour dough roll seems inadequate, almost inappropriate, and becomes too thin for a burger… you’ll end up wishing for a better bun. The french fries are alright. The patty itself gives this burger the potential to be amazing, but when little care is given to the rest of the components it hard to reach that burger ranking. 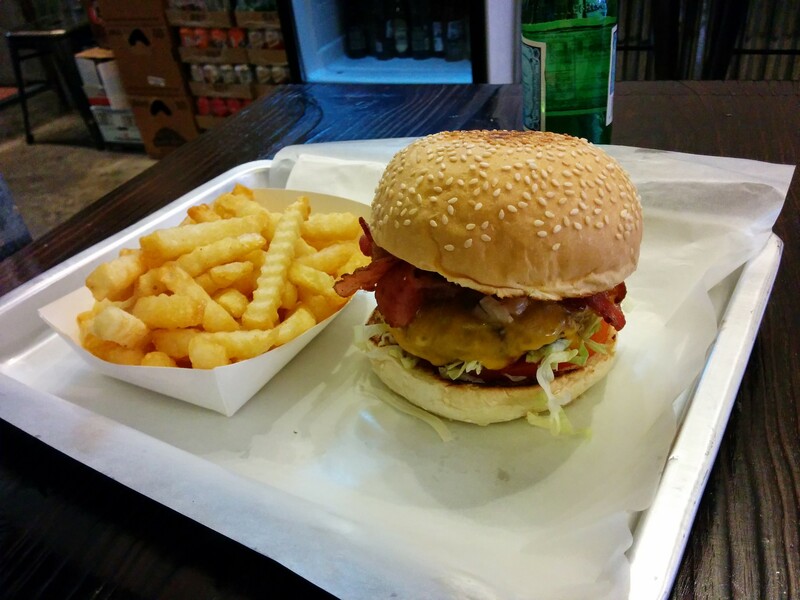 At 108.00 HKD, not including fries, there are a few other places around handing out better burger experiences. Beef & Liberty, newly opened in Hong Kong, has a nice set up; and I very much enjoyed one of their spiked milkshakes… unfortunately, probably more than the burger.